The Korean Folk Village is partly a theme park and is said to offer visitors a glimpse into traditional Korean life. There are plenty of old-style Korean buildings, arts and crafts displays, performances, and more. You could visit for an hour or spend the entire afternoon, and there are really a lot of interesting things to do and see for everyone. Korean Folk Village is a lovely cultural village that consists of traditional houses, culture and customs of Korea’s Joseon period. The village consists of relocated hanok houses, buildings and artifacts that depicts the lifestyle of the Joseon period. Thus as it is, this village was used as a filming location for many Korean historical dramas including the Jewel in the Palace, Sungkyunkwan Scandal, My Love From The Star, Six Flying Dragons, Dong Yi, Empress Ki and Moon Embracing the Sun. And yes, there are posters, molded hands and autographs here…even some props on display…. The Folk Village is truly home to Korean heritage and many features of olden Korean culture have been collected and preserved. There is even a traditional marketplace offers exotic flavors of Korean food from various regions, and numerous shops sell a variety of traditional handicrafts and souvenirs, most which were made there at itself by skilled craftsmen. Korean Folk Village introduces traditional culture from the late Joseon period to both local and international visitors through cultural classes experience, shaman faith, seasonal customs and others. 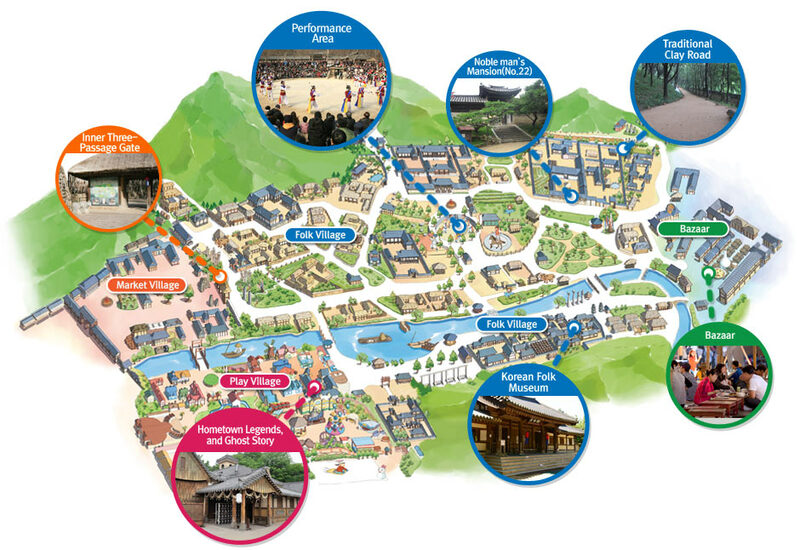 Also, the village shows various places with unique features such as a farming village, private house, official districts, Confucian academy, seodang (village school), and a village street in realistic descriptions, as well as, a nobleman’s house and traditional workshop. Visitors like me who enjoy historical dramas and stories will be thrilled to participate and enjoy interesting performances such as nongak (farmer’s music) which I missed… and Equestrian feats aka acrobatics and martial arts on horseback – I swear these people were really born on the horseback, they are so at one with the horse. I was really enthralled by the performers amazing moves…. Check out the pictures I have here…..
Of course, for those who likes some fun rides, etc, be sure to check out the amusement park area and scream yourself hoarse with the crazy rides they have there such as the swinging Viking ship, Drop n Twist ride, Crazy Raft ride or enter the spooky Korean Folk Village’s Legendary Hometown…..
Of course, do not forget to stop to smell the flowers or enjoy the glorious scenery around this place…..
From Exit No. 2 of Moran Subway Station (Bundang Line), take City Express Bus N. 1116 and get off at Korean Folk Village (70 minute ride). From Exit No. 6 of Gangnam Subway Station (Seoul Subway Line No. 2) or Exit No. 7 of Yangjae Subway Station (Seoul Subway Line N. 7), take City Express Bus N. 1560 or 5000-1 and get off at Korean Folk Village (30-40 minute ride). From Seoul Subway Line 1 to Suwon Station. Then, take exit 5 and once outside of the station you will find a tourist information office. There, you can get a ticket for a free shuttle bus that will take you directly to the Korean Folk Village. Runs five times a day (10:30, 11:30, 12:30, 13:30, 14:30, 30 minute ride). * In case of rain, the programs are subject to change/cancel. good info to go there. shall plan this for future if go. wow! MIera, so nice that you always got chance to travel 🙂 wish can visit this Korean folk village. Yes I visited the place when I was in Seoul last year, quite a good experience.